Eurasia Press & News » Could Libya be Russia’s new Syria? Could Libya be Russia’s new Syria? Comments Off on Could Libya be Russia’s new Syria? 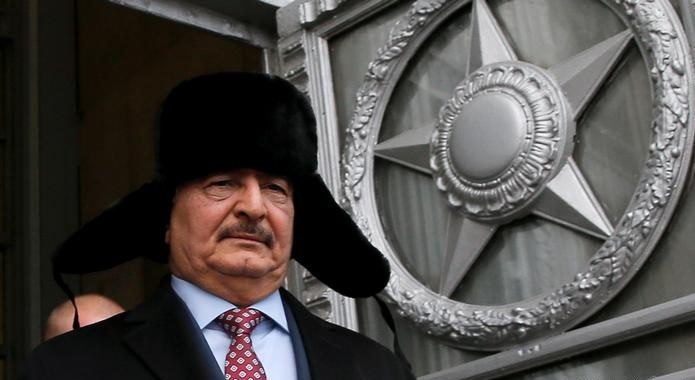 The rumors that Libyan General Khalifa Haftar has Kremlin support are as consistent as his advance on the country’s capital. In Syria, Russia has flexed its military muscles — but it isn’t showing its cards on Libya yet. As the conflict in Libya heats up, the words out of Moscow have remained cool and rational. During a recent visit to Egypt, Foreign Minister Sergei Lavrov said that Russia’s “task is to help the Libyan people overcome their current differences of opinion, and come up with a stable agreement” to reconcile the sides. Since early April, the forces of military strongman Khalifa Haftar (above) have been pushing towards the Libyan capital, Tripoli. That is where the internationally recognized government of Prime Minister Fayez Sarraj is based, which has accused Haftar of attempting a coup. Haftar heads the self-titled Libyan National Army, which is backed by a rival government in the east of the country. Russia seems to be trying to avoid taking a clear side in the escalating conflict. “It’s a very delicate diplomatic situation for Russia,” says Viacheslav Matuzov, a long-term diplomat now working as an independent Middle East expert. Various Russian allies support different parties in the conflict: Turkey and Algeria, for example, support the UN-backed Tripoli government, while Egypt and Saudi Arabia back General Haftar. Matuzov argues that the main reason Russia is nevertheless involved in this diplomatic muddle is Moscow’s fear that the chaos in Libya could allow the resurgence of the “Islamic State,”which would be a serious security concern for Moscow. But while Matuzov insists Russia is as neutral as its official statements are, Felgenhauer argues, “it’s obvious that Moscow is supporting Haftar” behind closed doors — something that the Kremlin has denied. In fact, both General Haftar and Prime Minister Sarraj have visited Moscow, but Haftar seems to have the edge in the Kremlin. He has visited three times since 2016 and was even taken aboard Russia’s flagship aircraft carrier Admiral Kuznetsov in 2017, reportedly for a video conference with Russia′s Defense Minister Sergei Shoigu. Felgenhauer believes one thing could have tipped the scales in Haftar′s favor: Money. After all, the strongman is in charge of nearly all of Libya′s oil-producing regions. “That means he has the money — which means he is important for Moscow,” the analyst says. Felgenhauer argues that despite the UN arms embargo on Libya, Moscow could be angling to sell Haftar weapons — or even already be selling them. The fall of Libya’s long-time dictator Moammar Gadhafi in 2011 lost Russia billions in arms sales, according to some estimates. On April 7, Russia blocked a UN Security Council​​​​​ ​​statement that would have urged forces loyal to Khalifa Haftar to halt their advance on Tripoli, insisting that the statement should urge all forces in the country to stop fighting. Felgenhauer sees the move as a clear sign of Russia’s tacit support for Haftar. According to various media reports, Russia may have another way of quietly taking sides in Libya. In late 2018, Russian daily RBC reported that there are Russian troops in the east of the Libya, citing a source close to the Russian Defense Ministry. The independent newspaper Novaya Gazeta published a video showing Yevgeny Prigozhin taking part in talks with general Haftar in Moscow. Prigozhin is a close confidant of Russian President Vladimir Putin. He is a shadowy figure who apparently heads Russia′s social media “troll factory,” as well as a private Russian military company called Wagner Group. It has reportedly turned up in conflicts all over the world, including in Eastern Ukraine, Syria, Venezuela and Central African Republic. In early 2018 Russia′s announcements of its plans to withdraw troops from Syria only increased rumors about a potential Russian military operation in Libya. However, Russia is unlikely to launch a large-scale intervention in Libya like it did nearly four years ago in Syria, in part because it is still entwined in the conflict there. Matuzov agrees that Libya won’t be Russia’s new Syria. For one thing, he says, the two military bases Russia established in Syria during the conflict mean Moscow doesn’t need another foothold to cover its strategic interests in the Middle East. And moreover, he adds, Moscow simply couldn’t afford a base in Libya.